It’s a goddess name worn by a Hollywood superstar. Thanks to Kezia for suggesting our Baby Name of the Day: Uma. Oh, wait. We’re not talking about a goddess of the silver screen variety. A Sanskrit word meaning flax. But mostly, Uma is another name for Parvati, the mother goddess in Hinduism. She has many aspects and names, but Uma is one of the more important. She’s a dutiful wife and mother, finding her joy in assuring the happiness of her loved ones. Here’s where the “Oh! Don’t!” meaning comes in. Parvati’s husband was god of the ascetics, and maybe something of a workaholic. She decided that she’d get his attention by practicing extreme self-denial. When she told her plan to her mother, her mother exclaimed “U! Ma!” hoping to dissuade her. 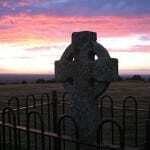 But the goddess followed through, her husband noticed her devotion – and all was well. Just like Parvati, Uma has a history of use as a given name in India – though I can’t tell if it is common. Uma Karuna Thurman rose to fame in 1994’s Pulp Fiction. The movie was a mega-hit, and she appears on the poster that graced thousands of dorm rooms. Thurman even scored an Academy Award nomination for the performance. Her career flourished in the 1990s. She re-united with Pulp Fiction filmmaker Quentin Tarantino for the two-part Kill Bill in 2003/2004. So where did she get her unusual given name? Her father, Robert, is a professor of Indo-Tibetan Buddhist Studies, presently at Columbia, and a world-renowned expert. He’s also the first American to be ordained a Buddhist monk. Her mother has an equally fascinating story. Nena von Schlebrugge was born in Mexico City to a Swedish mother and German father. Nena’s mother rescued her dad from prison after he refused to serve in the army as the Nazi party came to power. Nena became a model, was briefly married to Timothy Leary, and then met Robert Thurman. All of Robert and Nena’s children – Uma has three brothers – were raised Buddhist. Given her family’s background, maybe the name isn’t such a surprise. 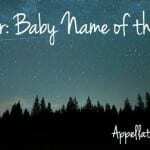 Like any short name, there are other possible meanings and origins. In Bosnia, Umihana is a familiar name, and Uma is a short form. Nineteenth century poet Umihana Cuvidina was an early female Bosnian writer. The word can mean horse in Japanese. In Portuguese, the number one is um. Uma is the feminine form, as in uma garota – one girl. As early as the 1960s and 70s, there were a handful of girls named Uma. But there’s a spike in 1994. The same year Pulp Fiction was released, there were ten girls given the name. As Ms. Thurman’s star has risen, the name has continued to climb. By 2014, there were 77 girls named Uma. The peak year was 2006, with 81 girls. From traditional names like Ruth and Lucy to novel ones like Luna and Blue, we like the ‘oo’ sound for our daughters right now. And mini-names are big – just think of Ava, Mia, and Zoe. 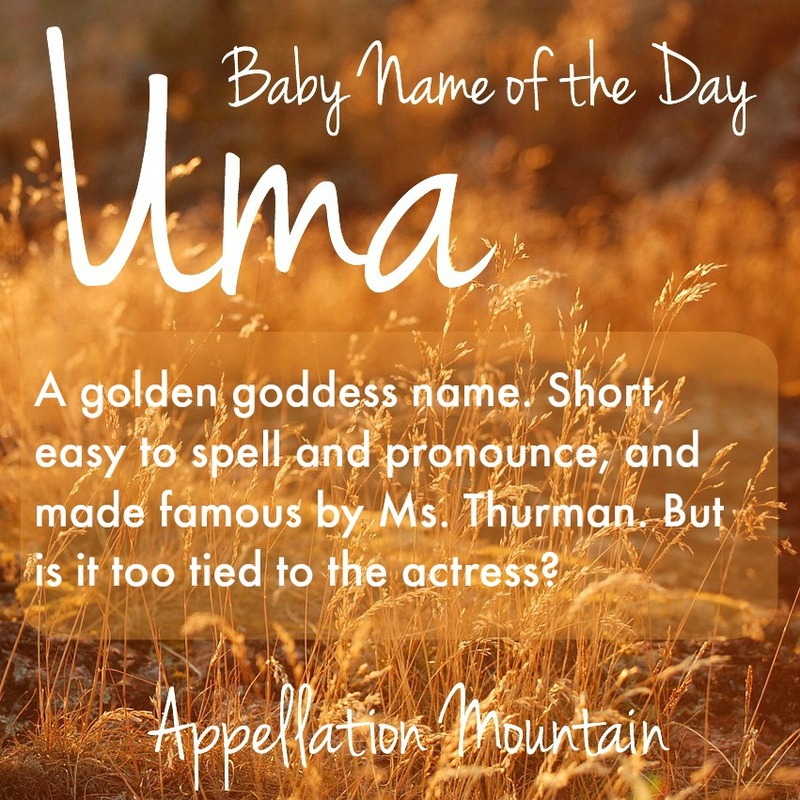 Uma could be a great cross-cultural name for a daughter. What do you think of Uma? Is it like naming your daughter Oprah or Cher, or does this name work? I’m very curious as to what people think of the name Uma. We are considering it for our 2nd daughter. I don’t feel like it’s inherently pretty but the more I hear it the more I think it’s beautiful. Our 2nd choice is Amia. I have an Indian coworker (living & working & planning to continue living in the U.S.) with a daughter named Uma. He said that it is not a common name in India (at least not his part of it), but he liked that it worked well in both languages.